Researchers at the University of Stuttgart develop a lightweight timber construction system combining robotic prefabrication with computational design and simulation processes, as well as three-dimensional surveying technologies used in engineering geodesy. In collaboration with Kuka, a manufacturer of industrial robot arms, and the timber construction and engineering company MüllerBlaustein, the partners investigate the potentials of robotic prefabrication in timber construction. Their goal is to develop innovative, performative and sustainable construction systems made from wood, which also expand the repertoire of architectural expression in timber construction. Small and medium-sized enterprises in Baden-Württemberg are leading the industry in the field for specialized timber constructions. In the past, timber fabrication processes were focused on either manual work or mass production of single elements. Although these techniques are elaborated and efficient, they are also inflexible. This is the reason for an increasing amount of interest in computational design and fabrication processes, as well as the use of industrial robots. Robotic fabrication substantially expands the range of manufacturing possibilities and offers more freedom for developing innovative, material-oriented and adaptive construction systems. The University of Stuttgart plays a leading role in the research of lightweight structures. 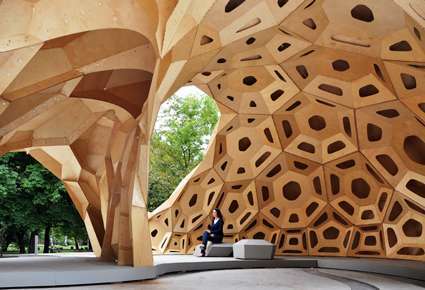 In the summer of 2011 the Institute for Computational Design (ICD) and the Institute of Building Structures and Structural Design (ITKE), together with students at the University of Stuttgart have realized a temporary, bionic research pavilion made of extremely thin plywood. The Research Pavilion, which has been widely published and awarded, demonstrated the constructional and architectural potentials of robotic fabrication in timber construction on a prototypical level. In the context of a research project funded by the European Union and the state of Baden-Württemberg with an overall budget of 425,000 Euro, these preliminary works are now being translated into a robotically fabricated, lightweight construction system with a practical orientation towards the specific requirements of the building industry. For this purpose, the ICD and ITKE partner up with the Institute of Engineering Geodesy (IIGS) of the University of Stuttgart, as well as industrial robot manufacturer KUKA, timber construction company MüllerBlaustein, Landesbetrieb Forst Baden-Württemberg and the Landesgartenschau Schwäbisch Gmünd 2014. The research project includes the development, fabrication and construction of a building prototype for the state of Baden-Württemberg’s landscaping exhibition “Landesgartenschau 2014” in Schwäbisch Gmünd in 2014. The prototype will be constructed as a lightweight timber plate structure, which will be robotically fabricated in collaboration with MüllerBlaustein. The goal is not only to investigate the possibilities of robotic fabrication, but also to demonstrate and reinforce the competitiveness and power of innovation of small and medium sized companies in Baden-Württemberg. The investigation of the potentials of robotic fabrication requires the development and application of novel architectural design, planning and simulation processes. A main focus lies on the coherent “digital chain” from the geometry modelling, to the structural analysis and digital fabrication, as well as the subsequent monitoring of tolerances and geometrical deviations. The University of Stuttgart therefore follows an interdisciplinary and integrative approach, which also incorporates the material’s characteristics and processing possibilities. Utilitzing the University’s own robotic fabrication equipment, innovative and practical construction principles are continuously being investigated and further developed into architectural systems.